BRDFs are commonly used for material appearance representation in applications ranging from gaming and the movie industry, to product design and specification. Most applications rely on isotropic BRDFs due to their better availability as a result of their easier acquisition process. On the other hand, anisotropic BRDF due to their structure-dependent anisotropic highlights, are more challenging to measure and process. This paper thus leverages the measurement process of anisotropic BRDF by representing such BRDF by the collection of isotropic BRDFs. Our method relies on an anisotropic BRDF database decomposition into training isotropic slices forming a linear basis, where appropriate sparse samples are identified using numerical optimization. When an unknown anisotropic BRDF is measured, these samples are repeatably captured in a small set of azimuthal directions. All collected samples are then used for an entire measured BRDF reconstruction from a linear isotropic basis. Typically, below 100 samples are sufficient for the capturing of main visual features of complex anisotropic materials, and we provide a minimal directional samples to be regularly measured at each sample rotation. We conclude, that even simple setups relying on five bidirectional samples (maximum of five stationary sensors/lights) in combination with eight rotations (rotation stage for specimen) can yield a promising reconstruction of anisotropic behavior. Next, we outline extension of the proposed approach to adaptive sampling of anisotropic BRDF to gain even better performance. 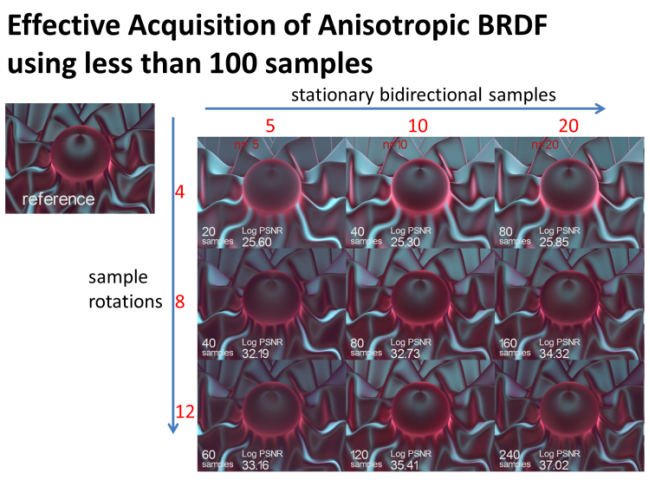 Finally, we show that our method allows using standard geometries, including industrial multi-angle reflectometers, for the fast measurement of anisotropic BRDFs. This research has been supported by the Czech Science Foundation grant 14-02652S. We would like to thank all revievers for time they spent by considering and improving our paper.